Wide showcase for the Magneti Marelli systems at the Geneva Motor Show with a focus on lighting, infotainment, electronic systems and Powertrain components. Magneti Marelli Automotive Lighting also on the Volkswagen Passat, “Car of the Year 2015”. Within the lighting area, the technologies of Magneti Marelli Automotive Lighting are adopted by numerous carmakers. After the great interest shown in Paris in the Audi R8 LMX, the Audi R8, officially launched in Geneva, also has a front lighting system with additional main-beam laser module developed in collaboration with Magneti Marelli Automotive Lighting. 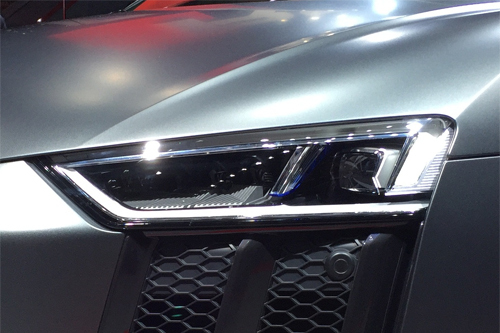 In addition to adopting the full-LED technology for all the lighting functions, the headlamp of the R8 integrates an additional high-beam module with a 2 mm² laser light source which produces a high-intensity light beam thanks to very high-level precision optics. A phosphor converter transforms the beam into white light with a temperature of 5,500 degrees Kelvin - the ideal conditions for night vision. The full-LED headlights include High and Low Beam and Daytime Running Light (DRL). The Audi R8 also adopts Automotive Lighting LED rear lamps and so does the Audi Q7. Automotive Lighting enables a wide choice of lighting systems for the Mercedes-Benz CLA 45 AMG which can have halogen, bi-Xenon and bi-Xenon adaptive headlamps with AFS. Another relevant supply, the full-LED headlamps for the Mercedes Maybach. Magneti Marelli Automotive Lighting solutions can be found also on the Cadillac CTS-V (Xenon headlamps), the Honda Civic Type R (Halogen and LED headlamps and LED taillights), theFord Mondeo and Ford S-Max (LED taillights), the Skoda Yeti (Halogen and Xenon headlamps) and the Volkswagen Passat All Track (LED taillights). In relation to high-performance cars, the Magneti Marelli presence is popular on all the most prestigious brands. On the new Ferrari 488 GTB Magneti Marelli is present with GDI pumps and Transmission Control Unit for the DCT dual-clutch gearbox, body computer and, in terms of suspension, a lifting system. Concerning the DS, the new premium brand of PSA, the DS5 is featured, for which Magneti Marelli supplies the Xenon and LED headlamps, the new infotainment system and the Transmission Control Unit and hydraulic actuators for the AMT.